Pasternack’s new line of high-speed end launch PCB connectors is comprised of 16 models in four end launch connector interfaces: 1.0mm (110 GHz), 1.85mm (67 GHz), 2.92mm (40 GHz) and 2.4mm (50 GHz). They provide VSWR as low as 1.10:1 and a wide bandwidth that supports high data rates. 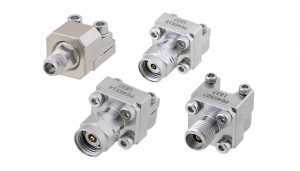 These high-performance end launch connectors don’t require soldering and are reusable.